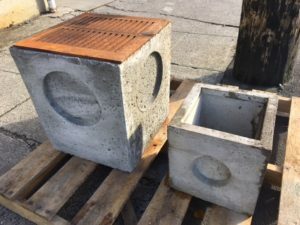 Concrete Catch Basin | Salmon Bay Sand & Gravel Co.
18 X 18 X 18 and 12 X 12 X 12 concrete catch basins sold with or without grates are in stock at Salmon Bay. Each size basin has 4 knock outs…1 per side. Cast Iron grates are available for both sizes…..there is no extra charge for the PNW rusty patina finish. We also have Risers available in 6” and 12” in order to make the 18 inch Basins deeper.